Women across the world are subjected to physical, sexual, psychological and economic violence, regardless of their income, age or education. Such violence can lead to long-term physical, mental and emotional health problems. Around one third of women worldwide have experienced physical and/or sexual violence by an intimate partner or sexual violence by a non-partner at some point in their lives. Intimate partner violence is the most common form of violence, peaking during women’s reproductive years in both developed and developing countries. Prevalence declines with age but still persists among older women. In the most extreme cases, violence against women can lead to death; around two thirds of victims of intimate partner or familyrelated homicides are women. 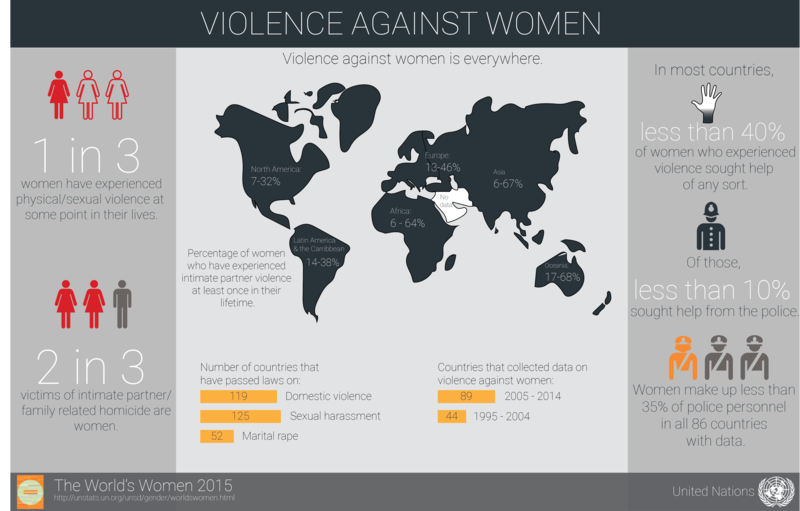 In the majority of countries, less than 40 per cent of the women who experienced violence sought help of any sort. Among those who did, most looked to family and friends as opposed to the police and health services. In almost all countries with available data, the percentage of women who sought police help, out of all women who sought assistance, was less than 10 per cent. Women’s reluctance to seek help may be linked to the widespread acceptability of violence against women. In many countries, both women and men believe that wife-beating is justified in certain circumstances. However, attitudes towards violence are beginning to change. In almost all countries with available information for more than one year, the level of both women’s and men’s acceptance of violence has diminished over time. More than 125 million girls and women alive today have been subjected to female genital mutilation across countries in Africa and the Middle East where this specific form of violence against women is concentrated. Prevalence tends to be lower among younger women, indicating a decline in this harmful practice. However, it remains commonplace in a number of these countries, with overall prevalence rates of over 80 per cent.